I wanted to pass along a letter that you have probably already seen. Brandon is one of the co-owners of DC Brau and has been working to not only start a business in DC (a daunting task by itself) but also to get legislation passed to allow manufacturers the same ability to provide tastings that grocery stores and liquor stores have. The legislation has a hearing date before the Council on March 31st. This seems like a no-brainer bill that will go a long way to allowing these new breweries (we’ve got a few others in the pipeline besides DC Brau) to thrive, make profits, create jobs, and pay taxes in DC. Even if you aren’t a beer lover, supporting this bill means supporting one of the few products made in DC by DC residents. I am writing you this morning as the co-owner of a small start up brewery located in Washington DC. DC Brau Brewing is the first “production/package” facility to be located inside DC in over half a century. It was our choice to be located within the District. We knew that some aspects would be challenging, especially since there has been no local protocol for businesses like ours in such a long time. Most breweries across the country offer tours of their facilities and a small tasting of their product. Usually a business is required to get an annual tasting permit to do this. After reviewing the District’s laws, we noticed there was no such provision for businesses of our type. Tasting permits are available for grocery and off premises establishments but nothing for manufacturers. This prompted us to work with an attorney to write the “Brewery Manufacturer’s Tasting Permit Amendment Act of 20ll”. I have attached a copy for your review. This bill would give us the same tasting rights as grocery stores and other off premise accounts. As a new business we are doing everything we can to succeed. We know having a tasting room will allow us to appeal to a broader market, generate beer tourism interest and give us the same chance to succeed as our counterparts in the surrounding states. 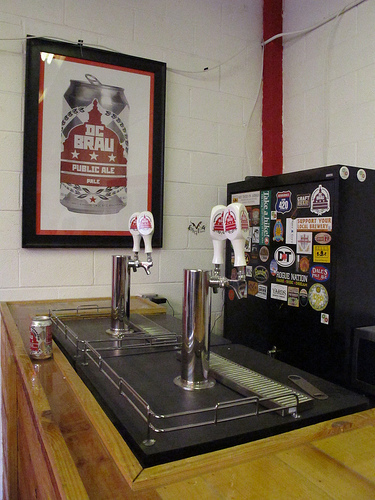 We took a look at DC Brau back in early March.